"We'll talk soon," says beleaguered studio Xaviant. It turns out the Battle Royale genre isn’t the bottomless goldmine that Fortnite and PUBG would suggest. First Radical Heights failed to save Cliff Blezinski’s Boss Key Productions from shuttering. Now The Culling 2 has performed badly enough that the developer is doing some soul searching. Specifically, players lament the allegedly ropey state of the game at launch, along with some fundamental changes in the sequel’s mechanics, which places less emphasis on melee combat and use of traps and focusses on gunplay much like Fortnite and PUBG. General community anger is contributing to the wave of negativity too. The original game is also seeing its Steam rating drop, with recent reviews categorised as mostly negative. 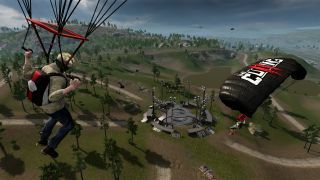 The Culling 2’s user base has fallen off a cliff, too. Not that it was a very high cliff to begin with. According to Steam Charts, while the first game peaked at 12,622 concurrent users, The Culling 2’s all-time peak was just 249 players. At the time of writing, one person was playing the game about an hour ago. I can’t help but be fascinated by this individual. Who is this dogged lone wolf, playing a Battle Royale game all by themselves? What drives them forward? Curiosity? Determination? Madness? Moreover, what happens to the game in this scenario? Do you automatically win and escape the area? Or are you simply forced to wait until whatever play-area shrinking gimmick crushes you into oblivion?